Some of you may be wondering who Gloria is. I consider her a dear friend and am very pleased to be part of a blog train in honour of this very special lady. When I first joined the Design Team at Ivy Scraps, Gloria was immediately helpful and complimentary about my designs. Her encouragement was so wonderful especially since this was my first (and only, come to that) venture into selling my designs. Over the years I have come to know her as a kind and loving person who has a real gift for digital design (Designs by Gloria Val Verde). The community at Ivy Scraps is a happy one and Gloria’s personality, talent, and helpfulness goes a long way to keeping it that way. 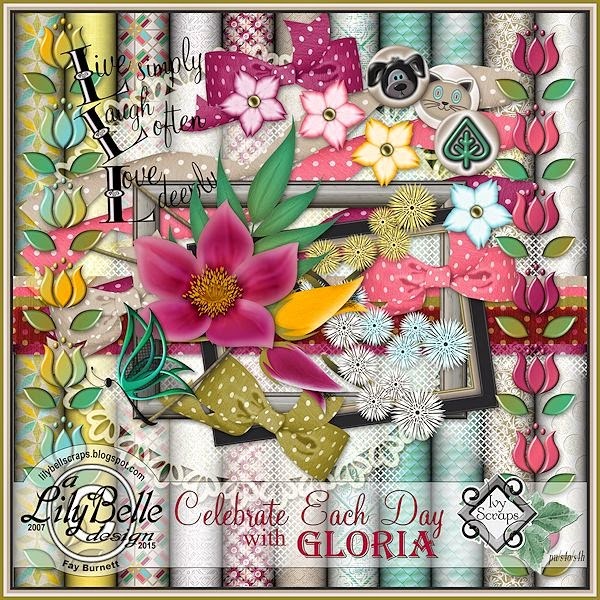 This blog train, celebrating Gloria, stops 10 times for you to download a collection of beautiful designs. Download my part and then follow the “track” below and stop at each of the remaining 9 stations. many thanks for the wonderful Freebie. Have a nice day. Thank you for this lovely kit in honor of Gloria. Thank you for this pretty kit, Fay! As always, your flowers are gorgeous, but I see lace and other goodies hiding in there. Can't wait to play with it. Thank you too, for the help getting this blog train set up! OMG Fay!!! What a truly GORGEOUS kit and the colors are just perfect! I am sooooo incredibly touched and honored and speechless that you all did this for me...THANK YOU soooooooo much by sweet friend!! Hugs!!! Thank you for this fun, colorful kit! I appreciate your generosity!! Beautiful designs, as always! Thank you, Fay!